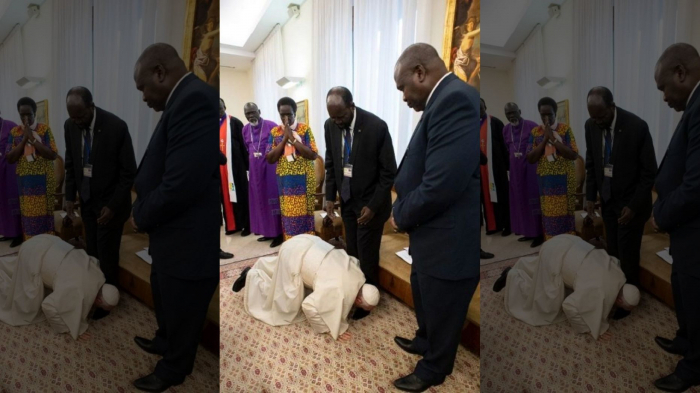 Pope Francis pleaded with South Sudanese government officials and opposition leaders Thursday to encourage the continuation of their fragile peace by getting on his hands and knees in a dramatic gesture and kissing their shoes, Fox News reports. South Sudan gained independence from Sudan in 2011 with the backing of many western nations, but a civil war erupted two years later and killed at least 400,000 and displaced millions. The conflict began as a feud between forces loyal to Kiir and Machar, the New York Times reported.